Today we introduce you a curious survival map where everyone is sparced into different glass bottles. Its name is World in a Jar Map 1.6.4. Shall appear in a bottle and we can only get out of it through the wooden plug to move through the rest of the world. 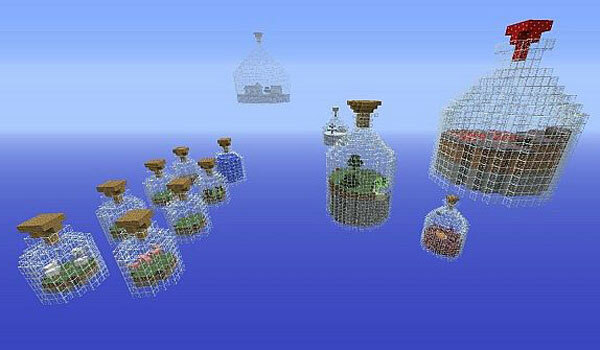 There are several more bottles, some pigs, some cows, another bottle for the Nether, etc.. Will you be able to survive in these conditions? 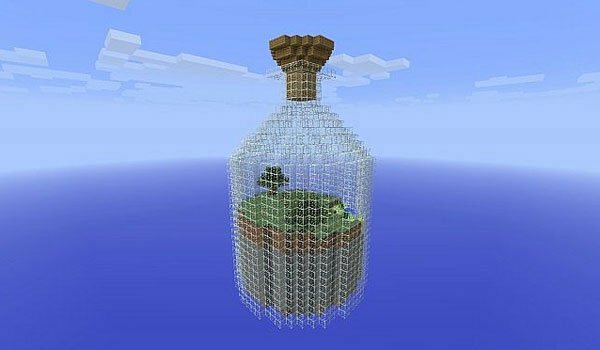 How to install World in a Jar Survival Map for Minecraft 1.6.4? Survive in a world of glass bottles! I think… going to all the bottles? Can you please update this for 1.5? If you type in /seed , it will give you the seed. If you create a new world with that seed, it will bring you the world before the bottles. This looks simple and easy……… I like it! where is the spawn point ? can anyone leave coordinates ? lol can we break the glass to go to another glass? or we break the thing on top then build to get to others? yeah… but you mine hundreds of redstones that are not very important…. the most awesome place in minecraft i ever seen!! where is the folder minecraft/saves on windows? this map looks incredibly fun! !